Among the many attractions along the Hellbrunner Allee, the Schloss Frohnburg Castle is a widely neglected one - although thousands of tourists worship it in the movie "The Sound of Music", in which it was used for the exterior shots of the Trapp villa. The real Frohnburg serves these days as a dormitory and concert venue for the Salzburger Universität Mozarteum, the art University. Originally, Schloss Frohnburg was built between 1660 and 1680 by Prince Archbishop Max Gandolf as a summer manor and called "Schloss Grafenau". 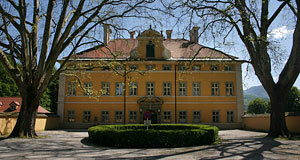 Through marriage, the castle went to the family of the Counts of Frohnberg who gave the new name to the building. Later it became the property of the Counts of Kuenberg. Schloss Frohnburg went through its prime around 1700, when its extensive parks and gardens were maintained by 13 gardeners. The castle had orangeries and orchards in the area that is now occupied by the Orff Institute. The site used as a library was originally a bathhouse, these days only a marble plaque saying "Limpida perluor unda" commemorates this fact. Another site from "The Sound of Music"
In 1957, the Count of Kuenberg (anybody noticed that the Empire and with it monarchy and with it nobility ended in 1918?) sold Schloss Frohnburg Castle to the Republic of Austria (see?) which used it as a dormitory for students of the music conservatory Mozarteum. In 1965, the building suddenly became known to millions of people all over the World as the Trapp Villa in the movie "The Sound of Music". Despite of having to actual connection with the Trapp family whatsoever, it is still a special place for fans of this Hollywood musical. In recent years, Schloss Frohnburg has been renovated to meet modern standards as a dormitory, concert venue and rehearsal site. There is a meeting room for 60 people and a concert hall for 80. These rooms can be rented by outsiders, although the castle itself is not open for sightseeing in the strict sense. Other attractions nearby include Schloss Freisaal Castle, Hellbrunn Castle, Schloss Emsburg and Schloss Emslieb, the Science Faculty and the ORF Landesstudio Salzburg.